A Discourse by Elder Parley P. Pratt, Delivered in the Bowery, Great Salt Lake City, Sunday, September 7, 1856. A Discourse by Elder Parley P. Pratt, Delivered in the Bowery, Great Salt Lake City, June 29, 1856. A Discourse by Elder Parley P. Pratt, Delivered in the Tabernacle, Great Salt Lake City, April 7, 1856. A Discourse by Elder P. P. Pratt, Delivered in the Bowery, Great Salt Lake City, October 7, 1855. An Address by Elder Parley P. Pratt, Delivered in the Bowery, Great Salt Lake City, September 23, 1855. A Discourse by Elder Parley P. Pratt, Delivered in the Bowery, Great Salt Lake City, August 26, 1855. An Address by Parley P. Pratt, Delivered at the Fourteenth Ward Schoolhouse on Monday, December 26, 1853. 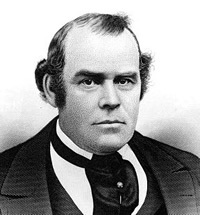 A Discourse by Parley P. Pratt, Delivered in the Tabernacle, Great Salt Lake City, July 10, 1853.